The startup is working in conjunction with Cape Fear Valley Health pilot test to add social features for Medicare beneficiaries with congestive heart failure. Health Wizz has updated and is piloting its unusual blockchain- and FHIR-enabled EHR aggregator mobile app, which uses blockchain to tokenize data, enabling patients to securely aggregate, organize, share, donate and/or trade their medical records. The idea is to enable individuals to control their health data as easily as they do their online bank accounts to allow better communication between healthcare organizations and caregivers to pave the way for a higher standard of care. "There are many new features on the platform meant to foster user engagement and social connectivity," said Health Wizz CEO Raj Sharma. "The social aspects of the app usher in a new era of digital health where users create and become part of their social 'health network.'" 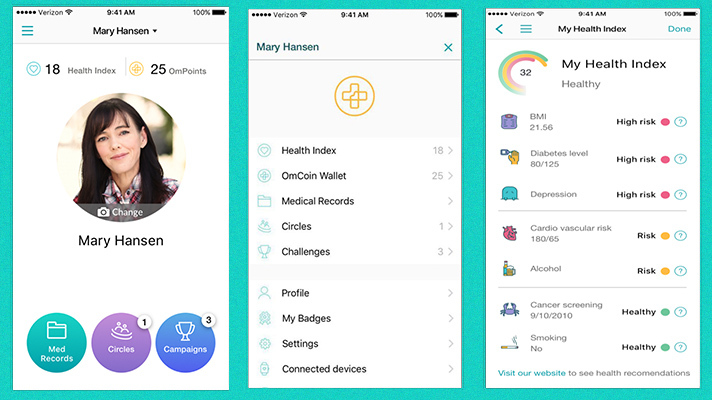 Users now can earn "health tokens," called OmPoints, and get rewarded for staying healthy. Users will be able to redeem accumulated OmPoints for tangible items such as Amazon gift codes or other gift cards. And participants can create their own health-oriented campaigns and challenges and invite their friends, family and colleagues to participate in these campaigns and challenges, for instance. Also new, institutions such as hospitals and pharmaceutical companies can fund health-related campaigns or research and create cohorts and invite them to participate. Using the Campaign Wizz Bridge Application Dashboard, they can reward participants with OmPoints for taking part in clinical trials or for adopting a healthy lifestyle. "This is especially important for patients and medical institutions who are living with and managing a chronic disorder," Sharma said. "Our partnership with Cape Fear Valley Hospital involves a jointly launched chronic disease management pilot program, where participants are Medicare beneficiaries with congestive heart failure. Our goal is to reduce hospital readmission in the first 30 days of discharge and improve outpatient care." With the pilot program at Fayetteville, N.C.-based Cape Fear Valley Hospital, it's not about what the vendor is trying to prove but rather what it is trying to solve, Sharma said. "[Patient] data always remains with the user. Processing is done via smart contracts, which are open and immutable processing paths that can be scrutinized and audited." The exchange and transfer of OmPoints are both happening on the blockchain on the new platform without the need for users to learn new technology, he added. In fact, users will not even be aware they are using blockchain to manage rewards points in their digital wallets, he said. "Blockchain, without a doubt, is one of the most innovative technologies since the Internet," Sharma said. "It has multiple applications. Finance systems, for example, leverage distributed ledger capabilities of the blockchain. Health Wizz is leveraging the smart contract capabilities of Ethereum blockchain to deliver rich data-sharing experiences. We will also leverage the immutability features of blockchain to verify the provenance of user data." The important thing for users of the Health Wizz platform to remember, Sharma said, is that user data will always be completely under their control. Users will have the tools to configure data bundles of their choice and enter into sharing contracts of their own will, in anonymity or pseudonymity mode. "The key to that particular transaction governed by contracts will be stored on the blockchain," he explained. "Once again, the personal medical data is not on the blockchain. The data always remains with the user. Processing is done via smart contracts, which are open and immutable processing paths that can be scrutinized and audited." In addition, the use of smart contracts and blockchain enables Health Wizz to create a marketplace where health data can be exchanged in a peer-to-peer manner without the need for data brokers. Health Wizz implements the FHIR HL7 standard to access data in a standardized manner – both on the data production side and the data consumption side. For the former, when a hospital or practice EHR allows users to access their medical records using a FHIR interface, the Health Wizz application enables users to leverage this interface to download their medical records on their mobile device. Starting January 1, 2019, CMS will require healthcare organizations to provide view/download/transmit capability for users' medical records using a standardized interface such as FHIR. "Some provider institutions have already started providing this capability," Sharma said. "Even if the health data was acquired in a different format, for instance, if the user took a picture of an old paper record, the Health Wizz app processes this data and makes it accessible on a user's mobile device using a FHIR interface." On the data consumption side, when institutions such as pharmaceutical companies and medical research organizations want to access clinical and genetic data residing on a user's mobile device, they can also do this using the FHIR interface in the Campaign Wizz Bridge Application. "This use case aims to reduce readmission rates for patients who are being treated for chronic conditions," he said. "At Cape Fear Valley Hospital, we are striving to get patients engaged in their health journey by using the Health Wizz app so they can interact with clinicians virtually instead of the hospital sending paramedics to patients' homes." Patients, for instance, earn OmPoints which they can spend on tangible items such as Amazon gift codes while improving their health while hospitals like Cape Fear can ultimately hospital reduce readmissions.